I've been after an SSD drive for a while. I've not bought one before due to not having the money spare and not knowing which one to get. There's quite a range of them out there and the difference in speed between cheaper ones and more expensive ones is quite pronounced. But can one rely on the manufacturers' stated speeds? Or are there some kind of shenanigans going on there like there are with LCD monitor contrast ratios and conventional hard drive gigabyte sizes? Well, I'm about to find out. 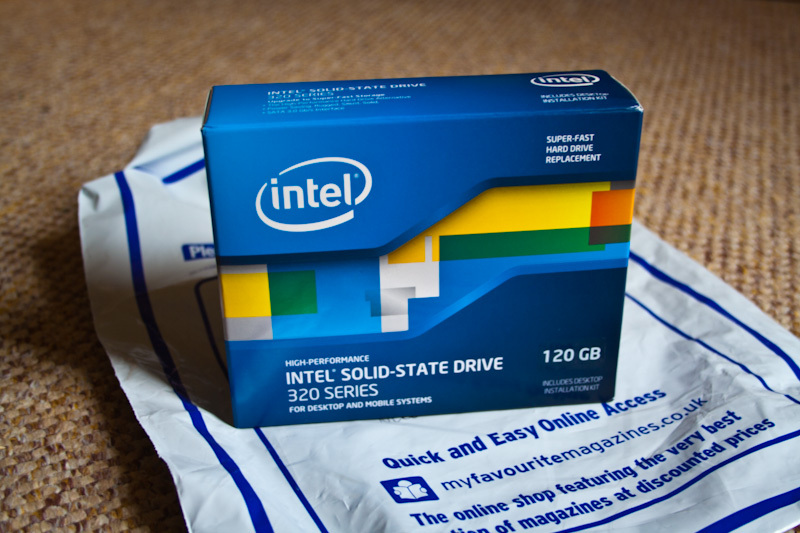 Luckily I won an SSD drive for myself in a PC Gamer competition and it arrived today. I was delighted to have one won; not just because it's free, but because I didn't have to choose which one to get. It's an Intel 320 Series 120GB drive. I didn't want to have to choose a drive because I just wasn't sure which one to get. Would I go for a very fast OCZ Vertex 3 or a Corsair Force 3? they have very impressive statistics, but just how fast are they really? And have they sorted out their reliability problems? Intel's SSDs don't seem anywhere near as quick, but would they offer a more solid experience? But even Intel had problems with their firmware and chipsets in the past. So which one should I buy? I just plain don't know and I'd hate to buy one drive and constantly wonder if I shouldn't have gone for a different one. So I was delighted to have the choice taken away from me. Time to open the box. This is the reseller version of the drive. It comes with a SATA cable, Molex to SATA power adapter (just in case you've run out), some screws and a mounting plate. SSD drives are the same size as laptop drives, so if you want to mount it in a desktop drive bay, you need to fit it to a mounting plate. Oh and there's a CD and a god-awful sticker. The retail box is slightly different. You also get a rubber drive sleeve and a USB adapter so you can use the drive externally. 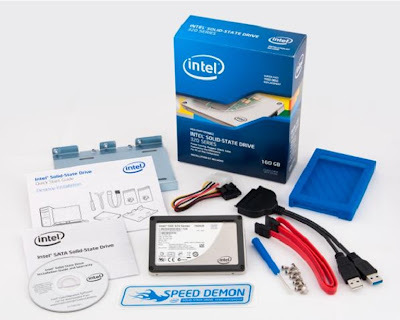 You even get a cheap screwdriver - it's nice that Intel make the effort to include everything you might need. Okay, so let's slap it in the PC and see what happens. Before I do, I'm going to check the boot time on my current system. According to the excellent Soluto, my PC takes 5 minutes and 14 seconds to boot. I've got a lot of stuff installed and my OS is highly customised with stuff like WindowsBlinds, Skype and a variety of other stuff running at boot. Sticking the SSD into my PC was very easy. It's just like any other hard drive. In it went and the BIOS saw it straight off and so did Windows. The CD that Intel supplied with the drive is a bit disappointing as it only contained a PDF of the warranty. The enclosed leaflet has a bunch of links to software you can download including a migration tool and the "Intel SSD Toolbox". The migration tool is a cut down version of an Acronis application and it pretty limited in its utility. My existing system drive was 500GB. 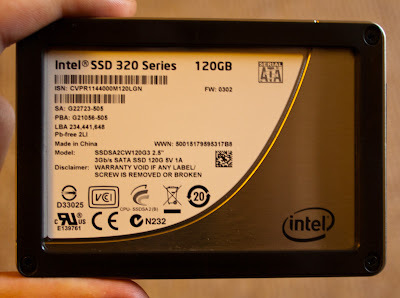 Just how was that going to be cloned onto a 120GB SSD? Oh and the Intel migration tool tries to trick you into registering with Acronis, no doubt so they can try to flog you a full version. But I resized the partition on my system drive down to less than 120GB and cloned it across. Not with the Intel tool (it failed), but with one from Easeus which I already had. Having cloned the drive, I rebooted and changed the drive boot order in the BIOS. To my surprise, the system booted first time and quite noticeably quicker too. It was quite odd to hear my system boot up without the accompanying rattle of a hard disk. As soon as it booted up, I ran the Intel SSD Toolbox. It suggested turning off pre-fetch in order to work properly with the SSD and it allowed me to do so with just one click. I also ran the optimizer which adjust the TRIM settings for you. Then I rebooted and looked to see what Soluto listed as my new boot time. 5 minutes and 14 seconds had become 54 seconds. Ooh. That's one hell of a difference and with an old Windows installation packed with things that slow the system. and 83% reduction in boot time isn't to be sneezed at. Whilst the cloned system was perfectly usable and performed acceptably, I might as well go for a completely new installation and get the full advantage of the drive. Already the results are impressive and the system feels much more responsive. When I switched from my old computer to my current one, I didn't notice as much difference as I do with the addition of an SSD drive. Tomorrow I'll go into detail on what happened when I wiped the drive and installed Windows from scratch. I've also delve into the technical details and run some tests. See you then. PS Big thanks to PC Gamer for awarding me this drive! "Sticking the SSD into my PC was very easy. It's just like any other hard drive. In it went and the BIOS saw it straight off and so did Windows." Sounds like you avoided the pain that a lot of us who have gone down the SSD route experience. In my case, the BIOS couldn't see the drive initially and had to buy a seperate SATA3 controller, as my motherboard was only SATA2 and failed. That then caused problems with boot ordering... and... you get the idea. What I didn't mention (and perhaps ought to) is that my drive is SATA2 and so is my motherboard. I did wonder what might happen if I had stuck a SATA3 in there. My Sata 3 SSD worked straight off the bat with my Sata 2 motherboard - it was window's that hated moving disk (with Norton Ghost - which at least made a backup when I had bad sectors unlike every other backup software - however the restored version bluescreened every time) however it was only after installing a new windows 7 and applications that I realised that the bios had turned off the extra Intel bios that does high speed. I switched it on (thus adding about 10 seconds to the bios bootup) and then had to reinstall windows again (sigh). Now it's great though! My Kingston 64gb SSD installed with no problems first time. But I'd done some research first. I plugged it in, let Vista detect it, then shut down. Swapped primary drives in the BIOS, then did a clean win7 install onto the SSD. Win7 formatted the SSD and - importantly - ensured the partition was aligned correctly. My boot time is roughly 25 second, with just Rainmeter, Avast and CCC starting up with Windows. Welcome to the land of SSD joy, Jon and Matt! 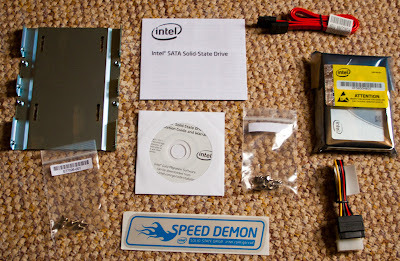 By the way, a SATA3 controller is around £14, and almost doubles the speed of a SATA3 SSD. Might be worth considering.